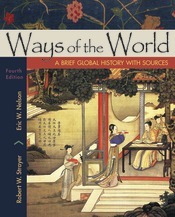 Ways of the World is one of the most successful and innovative textbooks for world history. This 2-in-1 textbook and reader includes a brief-by-design narrative that focuses on significant historical developments and broad themes in world history. With keen consideration of the needs of their student audience, authors Robert W. Strayer and Eric W. Nelson provide an insightful, big picture synthesis that helps students discern what matters most in world history--patterns and variations on both global and regional levels and continuity and change over time. With the same personal touch, the authors guide students to consider primary and secondary source evidence the way historians do.